The holidays are a time to kick back and relax, take your mind off any strenuous work and enjoy the simple things in life. Our Internet and mobile casinos have released some holiday-themed online pokies to get you in to the full holiday swing. Take a load off and enjoy some of these real money, highly entertaining and interactive slot games at our recommended online casinos listed in the table below. 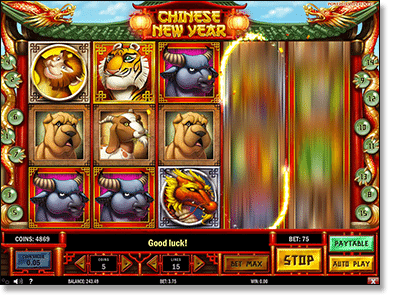 Chinese New Year – Enjoy Chinese New Year celebrations with Play’n Go’s musically-pleasing five-reel and 15-payline online slot game, featuring a bonus round, wild symbols, a gamble feature, and scatter symbols which trigger an advanced free spin mode. Bet as little as $0.01 and up to a maximum of $18.75 per spin. Easter Eggs – Enjoy a visually and audio-pleasant interactive Easter pokies games, with wild symbols which double all wins and substitute for all symbols (except the scatter symbol). Three or more scatter symbol and you are taken to the free spin feature, with multipliers up to 6x your bet. Activate the bonus round by spinning three basket icons and win up to 500x your original wager. Read our full review of Easter Eggs here. Santa’s Wild Ride – A 243-ways online pokie, Santa’s Wild Ride is an innovative slot game and our favourite holiday-themed pokie. 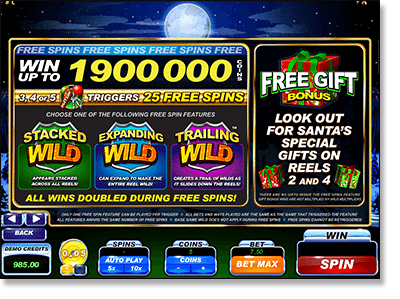 It features stacked wilds (stacked across all reels), expanding wilds (makes an entire reel wild) and trailing wilds (leaves a trail of wilds), a free spin feature which can trigger up to 25 free spins (with all wins doubled during this feature) and a max payout of 1,900,000 coins. Throw on auto-play if you wish, and bet from $0.30 to $7.50 per spin. Santa Paws – Rug up and grab a cup of hot chocolate and enjoy this icy and snowy Christmas-themed slot title. With bells ringing as the reels spin, this pokie is a five-reel and 20-payline game with a gamble feature and a free spins feature which can be re-triggered once activated. Min and max wagers – $0.01 and $100.00 per spin. 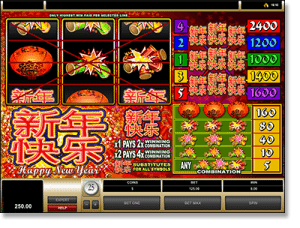 Happy New Year – Play Microgaming’s own take on the Chinese New Year in Happy New Year – a traditional three-reel and five-payline pokies game which details all combination and symbol payouts within the actual gaming interface. Take a trip down memory lane with this classic online replica of some of the older and fashionable slot game of the 1980s. Ho Ho Ho – A final Christmas-themed video pokie machine which has a host of bonus features, fantastic visuals, boasts action-packed gameplay and delivers a first-rate online pokies experience for both low and high limit stakes Australian players. It is a five-reel and 15-payline game, and has a minimum and maximum wager of $0.15 and $75.00. The holiday themed games are all available at the safe and secure online and mobile casinos recommended in our table above, and can be accessed and played for real currency by all eligible players 18 years and older. Register an account at any of the above gambling sites and you will be entitled to a free matched deposit bonus up to a certain amount of money. You can deposit funds safely via one of the several secure banking methods available within the cashier sections of each casino. All use a minimum of 128-bit SSL digital encryption technology to protect your financial transactions. The casinos are licensed by and registered with their jurisdiction’s gaming commission and are regularly audited by independent gaming governing bodies such as eCOGRA (eCommerce Online Gaming Regulation and Assurance) which test for player and gaming fairness. Sign up for an account at Slots Million to play these holiday themed pokies and thousands of other real money slot games. New users can claim a 2X matched deposit welcome bonus up to $100 when depositing for the first time.